**Haunting chamber pop and witchy drone somewhere between Tropic of Cancer and Haxan Cloak. White vinyl edition of 500 copies housed in printed inner sleeves and glossy gatefold jacket** "Launched in 2006 by Nicolas Devos and Penelope Michel, along with their project Cercueil (responsible for three albums particularly noteworthy), Puce Moment has so far existed mainly on stage, diluted over time (with only a handful of concerts) and imagery (projections, performances or contemporary dance pieces). Ice, dust and blinding flashes of white light: Puce Moment had the scene, only the soul and backbone were missing. This is being achieved now: Isolated in a cabin, the duo composed and recorded nine songs that make up their first album, between spectral marauding (Moonoom) and drone wizard (Legacy), resurrecting old ghosts (Video Dada single title survivor of their invisible past), revealing the first images of a future draped in chrome (L’ombre, composed for choreographer Christian Rizzo’s new project). 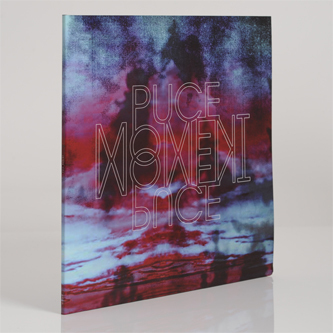 Mastered by Joe Lambert (Animal Collective, Young Magic, Dirty Projectors), Puce Moment is both the sum of a singular journey, fuelled by forays into dance and cinema."